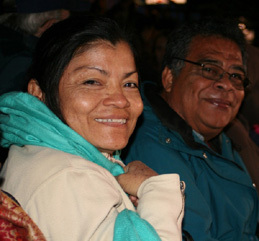 RODNEY BARKER (pictured here with Juanita Ruiz, our “personal banker” in San Juan del Sur) is PRESIDENT and founding member (along with his wife Betsy) of the Sister City Project, Rodney has led our group tirelessly since 1988. He is an immigration lawyer and a former member of both the School Committee and Board of Aldermen in Newton. 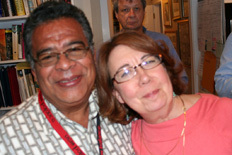 CARLOS GUZMAN (pictured here with Nancy Zollers of the Union Church in Waban and member of the SCP Board of Directors). 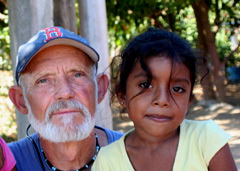 Carlos has been our IN-COUNTRY TREASURER in San Juan del Sur for over 20 years. He was formerly Principal of the Mongalo High School in San Juan. Our work would be impossible without him. DAVID GULLETTE is SCP VICE PRESIDENT and supervises construction projects and the use of appropriate technology. He also arranges for dozens of volunteers to visit San Juan throughout the year, and edits the Newsletters. His novel about San Juan del Sur, Dreaming Nicaragua, is available at http://www.fenwaypress.com. All proceeds benefit the SCP’s work. MARGARET MORGANROTH GULLETTE and ROSA ELENA BELLO co-founded the FREE HIGH SCHOL FOR ADULTS in 2002, and the Technical Institute in 2006. Before that, they worked together to provide literacy programs to women in San Juan del Sur and Ometepe. They have been friends and colleagues since the early 1990s. Longer bios can be found on the Adult Education page. 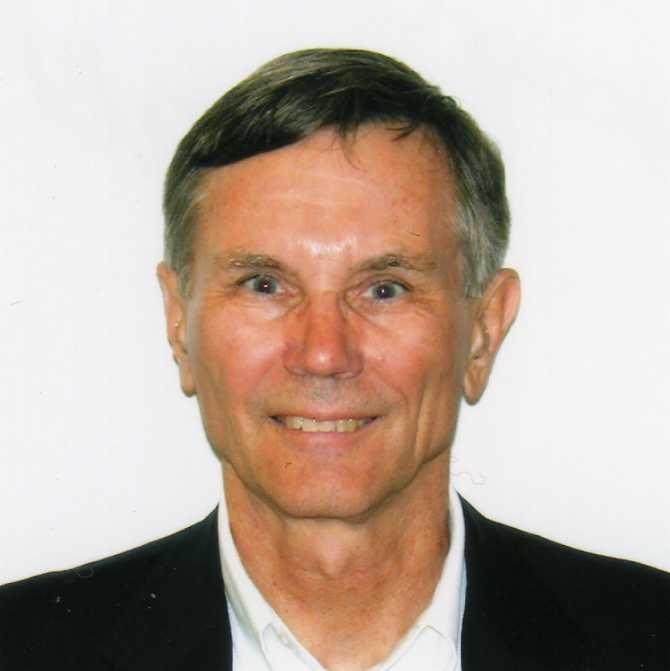 Donald F. Ross, Jr. is the TREASURER of the SCP in Newton. He is also the director of the Center for International Education at Salem State University. 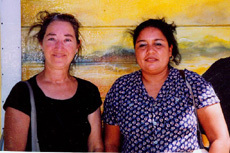 MARIA TERESA (“TERE”) VASQUEZ (pictured here with SCP Board member, and frequent delegate to San Juan, Mary Haaland) is DIRECTOR OF THE CENTRO DE SALUD (the government-run health clinic in San Juan del Sur). Tere is a an energetic advocate of public health, and welcomes visiting doctors, nurses and other healthcare volunteers. YADIRA PONCE (pictured here with Carlos Guzman at Fenway Park) is SUPERINTENDENT OF SCHOOLS in San Juan del Sur. She helps us keep track of maintenance needs for the roughly 18 schools we have built in the zone, and helps us direct supplies to rural primary and pre-schools. RAFAEL RUIZ (seen here with Keven Coster,who brings Newton South High School students to San Juan) helps coordinate activities and transportation for visiting school groups. 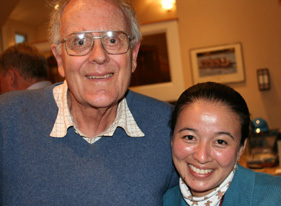 FIDEL PAVON (seen here with Simmons student and San Juan volunteer Karabeth Vanick) is DIRECTOR of the Newton Workshop on Appropriate Technology. He was responsible for the manufacture of over 600 BioSand Filters now installed in rural communities to purify contaminated well water. When the neoliberals took over in Nicaragua after 1990, Patricia anticipated that health budgets would be cut, as they were, and that health would decline for poor people, and she organized a group of people in San Juan to open Community Medical Services (CMS) as a nonprofit clinic specializing in prenatal care and pediatrics. They bought a building with their own money and opened a pharmacy and store to be as self-sufficient as possible. Patricia won grants to start a network of health outreach workers in the rural communities. She completely changed the idea of what civil society could accomplish for health in San Juan. That group of partners in health included Dr. Rosa Elena Bello, who continues to run CMS and its allied institutions and is trying to get official nonprofit status for it from the government as the Patricia Claeys Foundation. Patricia bore two children In San Juan and raised them there for some years. Then, after her 10 years of productive work in Nicaragua, she returned to Belgium. She joined the International Centre for Reproductive Health at Ghent University. Her practical and caring approach to the ICRH team in the 12 years she worked made it possible for her to successfully initiate and supervise an impressive number of research projects and theses in many diverse countries. One of these projects, cervical cancer screening and care, has been run by Rosa Elena Bello at CMS for many years. Patricia, Rosa Elena, and Margaret Gullette wrote the first grant for literacy programs for women. 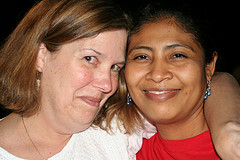 Patricia returned to San Juan many times, including in August 2001, when Rosa Elena, she, and Margaret celebrated the commencement (315 women) of the first adult literacy program. Patricia didn’t just charm and inspire people: she also gave them slogans of development that they might not know (“Malnourished children need food“), and she bullied them with a look (as if she were saying mentally, “There’s some reason why you can’t do this next important thing? !”) Many people admired her–even her exasperation and haste, which came from the urgency of local needs–and learned from her. Her death at so young an age, when she had so much work left in her for the world, is profoundly distressing. Her colleagues in Ghent write on behalf of all of us “Patricia inspired and motivated us with her well known determination, knowledge, insight and humor. We remain humbly behind, remembering the powerful personality that she was and the endless persistence she showed us, always thinking first of others and fighting for the right to “health care for all”, especially for women. Even though her illness was never far away, her fighting spirit persevered. She died peacefully at her home in Ghent (Belgium) on June 30th 2008, of breast cancer. A foundation has been created in her honor, The Patricia Claeys Foundation.